Come and spend your Summer holidays with us! This year La Mandarina de Newton offers once again its Summer Camp. It will be 3 theme weeks (‘Mercatech Lab’, ‘Science MasterChef’ y ‘Abracadabra! It’s Science!’) in which we will explore topics related with science, technology and audiovisuals. Each week we will be working together on a common project that will result in a showcase open to the families on the last day of each week. We will organise a special market in which the products shown will not be the usual ‘region’s best products’, but those that will be created by the little ones. A market of technology in which the protagonists are the kids and their creations! During this week we will become MasterChefs and we will give wings to our creativity and imagination while exploring the scientific secrets of the food. On the last day we will share our ‘scientific recipes’ with a surprising and unique tasting menu. Because science and technology can be magical, this week we will become little “scientific magicians’. Our tricks will leave dumbstruck all of you attending the final magic, science and technology show that we will be creating together. Click here to see it on issuu. Registrations are now open! Click here to go to the live registration form. 1 - We will work together in a common project exploring concepts of science, technology and audiovisuals. 2 - The price includes all the activities and entrances to institutions (parks, swimming-pool, etc..). The price does not include meals. We suggest that the kids bring their own food. 3 - We offer optional morning service host from 9am to 10am (7 euros/day). 4 - Registration will not be considered effective until payment of at least half of the registration fee. 5 - Registration is on a first come, first serve basis, until the places are filled. 6 - We work with small groups of kids of a maximum of 12/group/week. The animal kingdom. Why? Why? 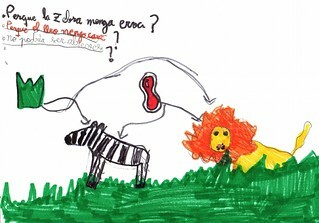 This March, with the group of 1st graders at Tàber primary School, we asked ourselves about our doubts related to the animal kingdom, a topic that is always fascinating for the youngest minds. We believe that is very important and interesting to promote the innate curiosity of children, often limited by the absurd grid of adult vision. During the session we let our imagination fly and a lot of interesting questions emerged. We are soon going to answer them. It is true that developing the capacity to explore and observe is fundamental, but it’s also necessary to train the ability of asking ourselves questions. But how can we help children to train in the art of thinking? The key that might help us in this task is liberating them from all kind of limits and impositions, letting the questions flourish without any kind of filter. We assume that any matter that arouses an interest in little ones, will push them to learn, activating their own process of reason and self-judgment. And this is only first step to increase the desire of having a wider and deeper knowledge. From April 4 (until June 16, 2016), at the Mandarina Space we will start the last quarter of workshops of this academic year! We’ll keep with our theme days: the Tech Tuesdays, the Cinematographic Wednesdays and the Scientific Thursdays!! Scratch, make makey, 3D printing, video animations, biology, physics, chemistry… and lots innovation and creativity!! For sure your kids will have a great time with us, learning while having fun!! Workshop of technological experimentation using Scratch, Makey Makey and 3D printing, for children aged 7 to 12 years old. Working in a creative and funny way and letting imagination and creativity fly, we will re-invent our environment: we will create our own video games, build a unique joystick with clay, turn bananas into piano keys, 3D-print the instruments of our mini music group… there is no limit for imagination! Workshop of video animations creation, for children aged 6 to 12 years old. In this workshop we will create our own animated films, make the scripts, create the characters, design and build the scenery and record their creations. We will experiment together a cinematographic process that will end with the a Mandarinic Film Show, open to all the family and friends! Workshop of ‘hands-on’ science experiments, for children aged 6 to 12 years old. Starting from the questions of the participants, we will design and develop little hands-on science research projects. We will promote individual observation, group research and reflection and communication. Specially designed for those kids who do not want to stop experimenting! *Quarterly registration only. Prices include all the material needed for the workshops. If you have participated on the last quarter, you will benefit a 10% discount; if you bring a friend, you will benefit a 5%! During this quarter we will also offer you several single-day workshops! We will keep you informed! Check out our webpage, our blog or subscribe our Newsletter! We will keep you updated! Come and spend your Easter holidays with us! This year La Mandarina de Newton also offers you a Easter camp for the little ones! We propose you 4 creative mornings for your kids to explore and give wings to their imagination and creativity inspired by concepts of science, technology and audiovisuals. During these 4 mornings we will be working on a common project which ultimate goal will be to create our own MakerLab exhibition! It will be a veeeery creative week!! And on the last day we will be showing our MakerLab to the families! 1 - The price includes all the material necessary for the camp activities. 2 - The price does not include meals. We will have a little pause in the morning and we suggest kids bring their own food. 3 - Registration will not be considered effective until payment of at least half of the registration fee. 4 - Registration is on a first come, first serve basis, until the places are filled. From January 11 (until March 18, 2016), at the Mandarina Space we will start the new quarter of workshops! We keep with our theme days: the Tech Tuesdays, the Cinematographic Wednesdays and the Scientific Thursdays!! Also remember last september we re-designed the workshops. The next quarter we will also offer: scratch, make makey, 3D printing, video animations, biology, physics, chemistry… and lots innovation and creativity!! From September 28 (until December 18, 2015), at the Mandarina Space we will start the new quarter full of activities! We keep with our theme days: the Tech Tuesdays, the Cinematographic Wednesdays and the Scientific Thursdays!! But there are also some news!! We have extended the duration and re-designed the workshops: scratch, make makey, 3D printing, video animations, biology, physics, chemistry… innovation and creativity at the Mandarina Space!! *Quarterly registration only. Prices include all the material needed for the workshops. If you bring a friend, you will benefit a 5% discount! To celebrate its 35rd anniversary, ‘l’Altra ràdio’ of Radio 4, together with La Mandarina de Newton and with the support of the Catalan Society of Sci-fi and Fantasy organize during May, a series of activities at the Mandarina Space. Two workshops for children, during which they will have the opportunity to learn how radio-broadcasting works. These will be a firsthand radio experience that will also let them learn the importance of communicating in and outside the recording studio. Finally, and because these activities are organised together with FantasTIC short stories contest, the kids will also have the opportunity to broadcast a short story written specially for the occasion by the writer Jordi de Manuel. The two workshops are complementary and each lasts 1h30. Wednesday, May 13, from 6 to 7:30 p.m.
Wednesday, May 20, from 6 to 7:30 p.m. The price is 10 euros/kid and includes the two workshops. You can find registration form here. Places are limited! Finally, on May 27, l’Altra Ràdio program will be broadcasted live at the Mandarina Space. This will be also an unique opportunity for some of the workshops attendees, as they will be broadcasting live for the program what they have prepared during the practical sessions. After the program there will be a little party, open to anyone interested in celebrating with us the 35th anniversary of the l’Altra Ràdio program, the tech and audiovisuals dedicated radio program. Apart from our own Summer Camp at the Mandarina Space, we will be also offering another Summer Camp, Culturnautes, together with CCCB. Two different options for your kids, both ‘made by’ La Mandarina de Newton. A journey through the galaxy of contemporary culture! A summer camp organized by CCCB and La Mandarina de Newton, in collaboration with the Barcelona City Council and Obra Social ‘la Caixa’. Tell stories with images, reinvent the city through theater, make an experimental short-film in honor to Alice in Wonderland, build the house where you would like to live and enhance your human skills inspired by the new advances on science and technology. Explorers will be grouped according to their ages: 6 to 10 years old and 11 to 14 years old. During the Summer Camp we will be working on the different lines developed at the exhibitions and activities that took place at CCCB throughout 2015. We will explore them through workshops and other recreational activities at different spaces in CCCB. We will offer a creation lab with a high dosis of experimentation and new formats. Culture with a high content of technology that will help us understand our present. Culturnautes consists of five weeks, five proposals with an independent but complementary content. They are a joint proposal of CCCB and the GR, A Home in Progress Film, La Mandarina de Newton, El globus vermell and Teatro de los Sentidos. Registrations are for weeks and they are open from April 18 until June 15. A couple of months ago the Fundació Collserola organized a meeting in which professionals from different disciplines and backgrounds shared their passion for their jobs with the high school students from Avenç School. This was also a unique opportunity for the students to share their concerns about their future professional choices and have some of their questions answered by successful professionals. Within the invited speakers there was Irene Lapuente, who explained students her academic background and the origins of the company she runs, La Mandarina de Newton. She also shared her experience as a student, the decisions she made and how, in her opinion, the doubts and concerns students usually have at the time of taking decisions related to their professional path, are just part of the game! Here you can watch the video of meeting and listen to the advices and some interesting stories of these professionals. After the success of the exhibition at CCCB (Barcelona), BigBangData is now at Espacio Fundación Telefónica in Madrid, where it will remain open to de public from March 14th until May 24th. As it happened in Barcelona, during this period La Mandarina de Newton will be traveling to Madrid to deliver a series of technological workshops that we specially designed for the exhibition Big Bang Data. We will be running three different workshops during March and April: “We are the Cyberspace“, “Geolocation!” and “Fingerprints and Satellites“. These are workshops for families with children willing to raise awareness, in a entertaining and dynamic way, about the traces we leave behind as Internet users, for example the ones known as Big data. We live in a highly technological and hyperconnected society. We are ourselves, voluntarily or not, an important source of data. In this workshop we explore the concept of Data: What is Data? Data are sets of quantitative and qualitative values attributed to certain variables. Do we have Data? Of course we do! From de most numerical data, such as our height, weight or corporal temperature, etc., to the most qualitative ones, such as our favourite color, or the music we love, etc. Starting from de concept of Data and its relation with the individuals, we will generate sets of information: What is information? Structured, organized and interpreted Data. Is information important? It certainly is! Information can lead us to knowledge. Knowing our environment can help us working with it in our favor. Dates: March 22nd and April 26th. Hours: from 10:00 to 12:00. Many of us live in cities, but often we don’t give it too much importance and we interact with our urban environment in a quite utilitarian and not so much analytical attitude. This workshop wants to give the opportunity to look at our cities in a new way, as spaces filled with data, information and knowledge. On the other hand, it also explores the concept of geolocation and interpretative framework. In this workshop we will also briefly explore the concept of Data. What is Data? Data are sets of quantitative and qualitative values attributed to certain variables. Our cities are full of Data: cleanliness and pollution levels, population levels, building typologies, etc. In order to let the group get to know and explore its surrounding environment, we propose the free walks around the Espacio Fundacion Telefónica, aiming to allow them collect, share and analyze their own Data. Hours: from 12:15 to 14:15. Thanks to the information and communication technologies, local data can be acceded worldwide. We can find behavioral patterns from anywhere in the world and understand the planet as a single entity. In this workshop we will explore concepts such as data crossing. Hours: from 15:00 to 17:30h. Tv Science at "Connexió Bcn"